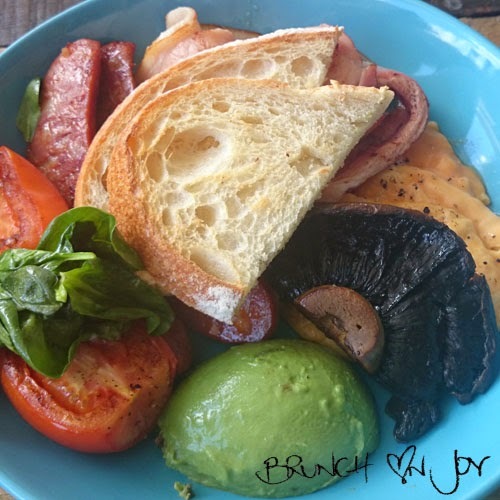 I rode my brand new bike for the first time around Parramatta river and after an hour of riding it was time to reward myself with a decent big brunch. In amongst a few other new trendy cafes near Rhodes train station, I picked Lid & Jar mainly because it oozed a cool hippy industrial warehouse appeal and there was somewhere for my bike. Keeping it simple, there are 12 options on the all-day menu which is a hybrid of breakfast and lunch aka brunch :) There's bircher muesli, brioche french toast, bacon & egg roll and an interesting version of chorizo salad and quinoa porridge. 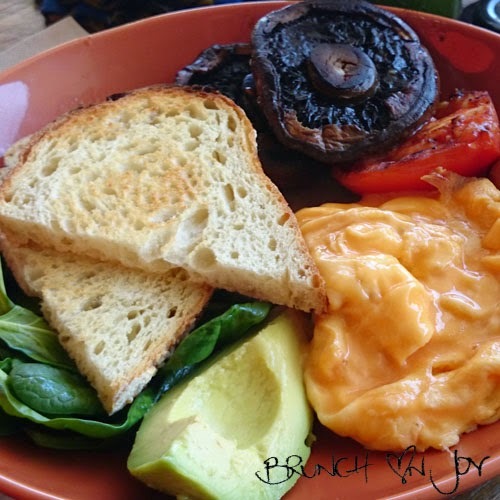 The big breakfast makes an appearance as a generous serving of bacon, chorizo, roast tomato, mushroom and spinach on sourdough with a choice of fried or scrambled eggs. Another usual suspect on the menu is the corn fritters. 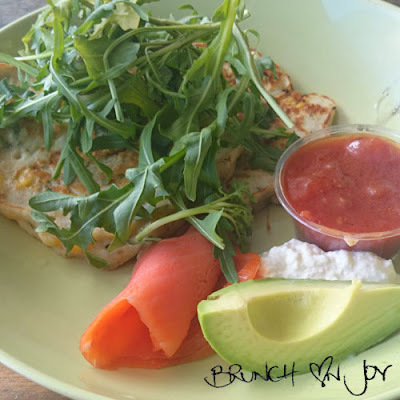 Herbed corn fritters with smoked salmon, avocado, rocket, ricotta and tomato salsa. Not quite like Bill Granger's classic but more like floury pancakes with corn folded through. 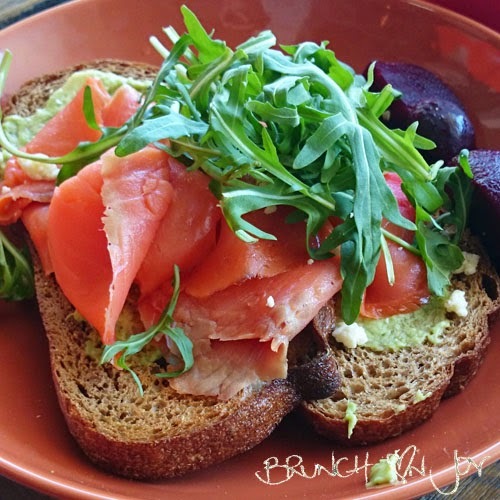 For the lighter option, there's "smashed" avocado on rye with smoked salmon, baby beetroot and crumbed fetta and rocket. I was actually more interested in the croissant with smoked salmon, scrambled eggs and swiss chesse but sadly they had ran out of croissants. 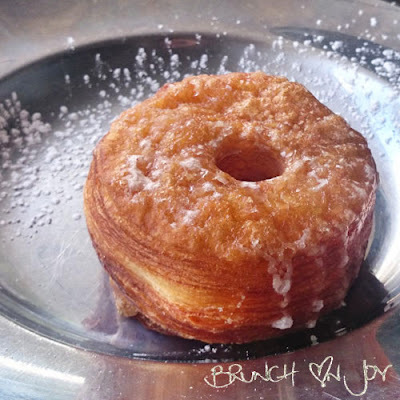 Last on the menu but probably the best, the croissant donut! This devilish indulgence was amazing and worth every single calorie count and grams of sugar and fat - yummo. Looking at the drinks list, I think it may have been longer than the food menu. 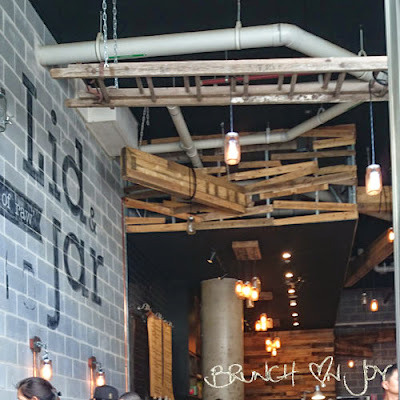 The latest craze, cold pressed juice is made daily with local fresh produce. 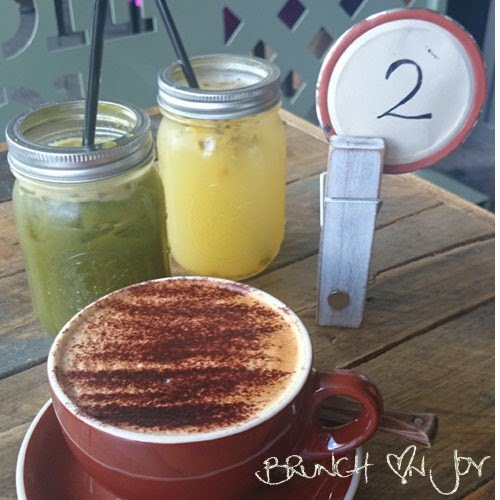 Pricey at $8.60 a glass, my favourite is the green juice with green apple, pear, spinach and coconut water. Coffee is nice served in decent mug sizes (didn't realise there was a difference) and bonus points the barista is the Latte Art runner up in this year's NSW coffee championships. Perhaps you could ask for a little something special with your coffee? 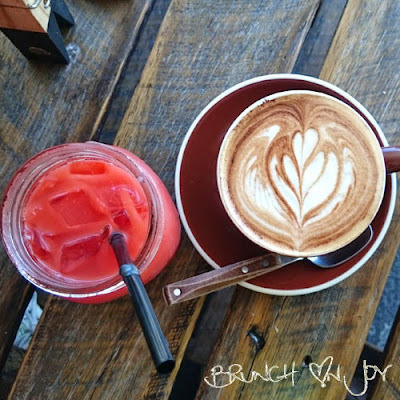 New to the all day breakfast scene, this franchise Lid & Jar in Rhodes has the right elements with the fancy water jug, cold pressed juices, good coffee and yummy Brewtown Newtown cronuts. It's a shame they don't have a proper kitchen to make poached eggs - a staple of all brunches and yolky-licious oozing right? ooh i love the look of your eggs on the big brekkie! would you believe that they cook that on a hot plate? clever!